The Spooky Attic is ALIVE! So this idea/website I’ve been shifting around in my head for the past few years has finally gone live. 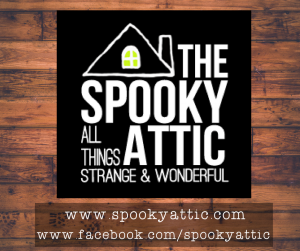 It’s called “The Spooky Attic: All Things Strange and Wonderful.” It’s basically an outlet for everything else I like that doesn’t revolve around Michigan. This will be for lovers of all things: strange, creepy, paranormal, antique, historical, dark, funny…ummm..basically everything I like. It’s an outpouring of the attic space in my head. I don’t know where it’s going to go yet or how it will change, but I’m looking forward to building it up and following it to wherever it takes me. Head over to Facebook and Instagram and give it a like.